Over the years, one of my favorite types of computer games has fallen under the rubric of "turn-based strategy"; basically, traditional units-in-hexes wargames where the computer takes care of all the bookkeeping for me. The first of these was probably, I'm guessing, Empire for the VAX/VMS system (and yes, I played it). Empire had supply points (cities) which could be captured, that could produce a variety of units with different capabilities (land, sea, air) and different attack and defense values. That's the core of this sort of game. There have been hundreds of implementations of these throughout the years. In my college years, I enjoyed XConq, which was a very thorough (though baroque) implementation. One feature of this sort of game is that the theme is more or less completely disconnected from the mechanics. Draw pictures of artillery pieces and tanks on the chits, and it's a World War II game. Change the artillery pieces into men in funny hats and the tanks into trolls, and it's a "fantasy" game. Change the trolls into cavalry and now you're in the Napoleonic era. So one core game mechanic can be used for many different vibes. For my money, the best in class of these games was the Warlords series. The original Warlords, which had both Mac and DOS versions, took place on a large continent named Etheria. 8 kingdoms each started with a single castle, a hero, and an army. Castles generated income, which could be used to fund more armies (and to support them; you had to pay upkeep for your existing troops). The goal was simple: take over the world. I liked Warlords better than the alternatives because the designer made some smart simplifying assumptions about unit management and generation. Often in games of this class the early game is fascinating and then by the late midgame you are staggering under the logistical weight of managing several hundred units, and suddenly it's not fun anymore. Warlords avoids that syndrome. The series reached its apogee of playability in the superb "Warlords II Deluxe." This added the concept of experience for heroes, more customization of what types of troops towns could product, the ability to 'vector' troops from where they were marshaled to a city where they should be deployed, and the idea of searching ruins for magical treasures which made the hero a better commander (this turns out to be less annoying than it sounds: rather than turning the game into a hunt for loot, the ruins were generally distant enough that setting out for one meant taking a serious strategic risk.) Warlords II Deluxe combined fast, intuitive play, a good GUI, a wonderful set of included campaigns and battles, a great map editor that spawned an incredibly prolific fan community, and -- unfortunately -- was written such that if you are running any OS more recent than Windows 95 (or, on the other side of the world, MacOS 9) you have little hope of actually playing it anymore. Warlords II Deluxe is one of the games I've considered buying an ancient PC just to be able to continue playing. Steve Fawkner, the author of Warlords, has continued to turn out the sequels. Each sequel has, to me, played progressively worse. I hate to say that, because he has always been kind and courteous to me, and I know that there are countless improvements under the hood. Steve is an AI geek. He'll talk about how the pathing in Warlords III blows away the WL II version, and how much more challenging the opponent is, yadda yadda yadda, but all I know is that it took me 15 seconds to play a simple turn of Warlords II Deluxe, and it takes 5 minutes to play a simple turn of Warlords III, 4 minutes and 46 seconds of which is spent watching the lovingly rendered animation of an orc move deliberately across the screen, pausing to make himself a hot toddy. You can actually watch the molasses drip from the jar into the teacup. It's very detailed. And oh so very slow. Warlords IV: Heroes of Etheria likewise continues the trend towards more bigger slower. If you don't believe me, download the demo and try it for yourself. So: newer doesn't always mean better. Prettier graphics doesn't always mean better. I would argue that some games can be made better by giving the player a view of his units that has less graphic detail, not more. Graphic designers that work in the real world understand this. Consider the icons used by the Olympics to denote sports. Surely, we could probably replace those with 3d holographic movies of people actually participating in those sports. And it would probably result in everyone having to take a few more seconds to think about what they were looking at rather than immediately mapping the simple icon to "Oh, that's skiing". Now, that's not to say that all games should have primitive graphics; obviously many genres work well with the best graphics you can throw at them, for example sports games (although, secretly, I would still pay good money for a "coaching" football game that just displayed the players as Xs and Os). And there are good reasons even for strategy games to animate these moves to some extent (the most obvious reason being that you need to show the player where a piece moved from and to, and if it just blinked to the destination, you'd be confusing them). But it's just as easy to kill a game by overloading it as it is by not paying enough attention to the presentation. I feel bad slamming the newer Warlords games in this way, because I'm sure it's not as if Steve walked in to the office one day and said "Hey, I've got this great idea: let's degrade the user experience somewhat and make the game slower." I have no doubt that he shopped an incremental improvement to Warlords and got told by a publisher "If it doesn't look as good as this other game over here, we won't be able to get it on the shelves, so therefore we won't publish it for you, so therefore no more Warlords sequels." I've been in that position myself, albeit not with games. If you're not a sales and marketing expert and the marketing guy says "Your product must have feature X or no one will buy it," you either decide that you know more about marketing than he does and ignore him, and then you go out of business and starve to death and people laugh at you, or you shrug, sigh, and go back to your office and add the feature the marketing guy asked for, even if you personally think it's sort of stupid. Thinking about it a little more, I'm not really saying "I wish Warlords III (or IV) had worse graphics." I'm actually making a complaint about the user interface. I'm saying "In the old version, I could accomplish this task in X seconds, and in the new version that same task takes four times as long." (Please note that I haven't gone and actually measured the times. I'm speaking of impressions here, but I think that that's valid: half of UI design is about managing user perception.) Perhaps if I hadn't used the older, more responsive UI I wouldn't care. Maybe I'm not Steve's market any more. Maybe I'm more persnickety about response time than other old Warlords fans. But fundamentally, this is the same complaint people make about Windows XP taskbar animations, or the 'genie' effect to and from the dock on Mac OS X. So the reason this all matters is that I'd rather spend time playing the (open source!) game The Battle of Wesnoth than buy Warlords IV because it has a better response time, even though I am 100% positive that Warlords has better graphics, better sound, better production values, fewer misspellings, and superior computer AI. That's how much the response time matters to me. I'm playing a strategy game. Strategy games are like chess. How often would you play a chess game if every time you told the computer to move a piece you had to watch it move for 15 seconds? Another way of saying this is: I have more confidence that there will be patches to Wesnoth to improve enemy AI than I am that I'll ever be able to make Warlords III's UI more responsive. The Battle of Wesnoth gets the response time issues almost exactly right, especially when you turn on the "fast animations" option. It's a clever game with some aspects to tactical combat resolution that I haven't seen in a game of this particular type before, that are worth mentioning. Each unit may have multiple types of attacks (for example, perhaps your bowmen also carry a dagger which is not as strong as their bow). When you attack, you have the option of choosing the type of attack (fire your bows, or stab the enemy with your dagger?) The enemy must respond with an attack of the same kind. If you have bows and the enemy is a thug with a club and no ranged attack, you can attack with impunity. This introduces a rock-scissors-paper aspect to the combat that is pleasing without being trivial to resolve. Thinking about it a bit more, I now realize that I have seen this before, almost -- it's very similar to the "hard attack" / "soft attack" handling in Panzer General. This is actually another way in which Wesnoth differs from Warlords. In Warlords the natural unit of control is the city, which provides a defensive bonus for units within it and generates income and potentially builds new units. Unlike Warlords, units in Wesnoth exert a (panzer-general-like) zone of control (as in PG and other games), and so you can actually use your forces to shape the battlefield, rather than simply attacking or defending with them. The scenarios were designed with care. The tutorial was a bit disappointing, and somewhat disorganized, and the unit recruitment rules are not well explained at first (you quickly figure it out once you move your hero out into the fray and then discover that you can't hire new units if you're not in your keep.) The first real scenario made things much more interesting, however, and the difficulty ramp is appropriately challenging without being impossibly steep. I liked that scenarios support victory objectives other than "kill everyone else" -- the first two scenarios in the first campaign, for example, are "reach this spot on the map without these two VIPs dying" and "kill foozle OR survive for 12 turns", respectively. The game is still in beta, and there are some areas that need work. For example, while different terrain types exist and are implemented, their effect on the game is fairly opaque; the impact on movement is fairly straightforward, but it's clear that it also impacts combat, but not how. When you decide what attack to use, the game tells you the percent chance success you'll have, so you end up having to kind of intuit the effect terrain is having by comparing those percentages across several battles. Personally, I'd rather see something like "+10% bonus due to being in the woods, +10% bonus for bravery" and not know my absolute chance of success than the inverse. Better yet, give me both. Also, while I've already said I like the responsiveness of the game overall, there are definitely GUI nits; right-clicking is supposed to bring up a context menu, but this doesn't work on a Mac running OS X. There are too many spelling and grammar errors; hopefully they'll fix those soon (I know, I know, it's an open source project: I should volunteer). The music is nice and understated. I enjoy being soothed while slaying the armies of darkness. The Battle for Wesnoth is one of the most polished games I've seen released under the GPL thus far. I approve of its SDL/multi-platform nature, and the fact that it's clearly made by people that understand and love the genre. I look forward to seeing it develop more, and I hope the team stays together and works on other projects as well. Perhaps the answer to the unceasing but understandable pressure from commerical game publishers for sequels that focus on flash and not simply on improving the user experience is for small projects to demonstrate that fun does not require seed funding from Electronic Arts to exist. Personal to Steve Fawkner: I can't promise you the sort of mad cash you get for making the top shelf at Best Buy, so I realize that I can't make a business case to you as well as your publisher can. But here's an offer: Your newest game, Warlords IV: Heroes of Etheria retails for $19.99 (at least at Amazon), and you just released Warlords II Deluxe for the PocketPC. If you update Warlords II Deluxe to work on modern Win32 systems -- most of which I bet you in fact had to do to release the PocketPC edition -- I'll pay you $19.99 for that, making it the third time I will have bought the game. I bet there's a few other people out there that would do the same, although, honestly, probably not more than a few hundred. But, y'know. While we may not be a market, we are dedicated fans. Don't run it by your marketing team. This can be our little secret. Some of these links may be of use to those of you who like turn-based strategy games. The Battle for Wesnoth is available for download. The Warlords series is what everyone else in the consumer space imitated. Xconq wasn't the first of this type of game, but it's the oldest ancestor still being actively developed. 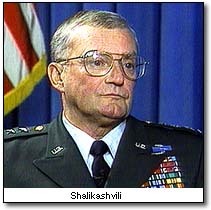 Arguably, the Panzer General games were a better implementation of the same basic gameplay mechanic with a different mise en scene (memo to self: try Fantasy General some time) (additional memo to self: Now stop thinking of General John Shalikashvili in a silk teddy. Ow ow ow ow ow.). Heroes of Might and Magic is another series of games in the same class that got worse with each successive iteration after the second. Milk that cash cow, boys! Branding! It's all about branding! It's a core design philosophy of Wesnoth that the key to this type of game is the user interface. We'd love to have better graphics than we do now in Wesnoth, but wouldn't compromise the interface in any way in exchange for them. Even when Civilization II went to an isometric view, I thought it was a bad idea -- overhead views might not look the most attractive, but they are the most usable. 3D views are even worse imo. It's interesting that I'm the founder of the project, and I haven't played any of the other games cited in your review not Warlords, not HoMM, and not Panzer General or Fantasy General. Quote: "There are too many spelling and grammar errors; hopefully they'll fix those soon"
We have someone, Eponymous Archon, who is taking time to concentrate on fixing these. He's doing an excellent job hopefully it'll be close to flawless by 0.7! Quote: "The tutorial was a bit disappointing, and somewhat disorganized, and the unit recruitment rules are not well explained at first (you quickly figure it out once you move your hero out into the fray and then discover that you can't hire new units if you're not in your keep.)" We're actually in the process of revamping the tutorial, although it still might need some more work. Quote: "while different terrain types exist and are implemented, their effect on the game is fairly opaque; the impact on movement is fairly straightforward, but it's clear that it also impacts combat, but not how." Every unit has a defensive rating on every type of terrain. 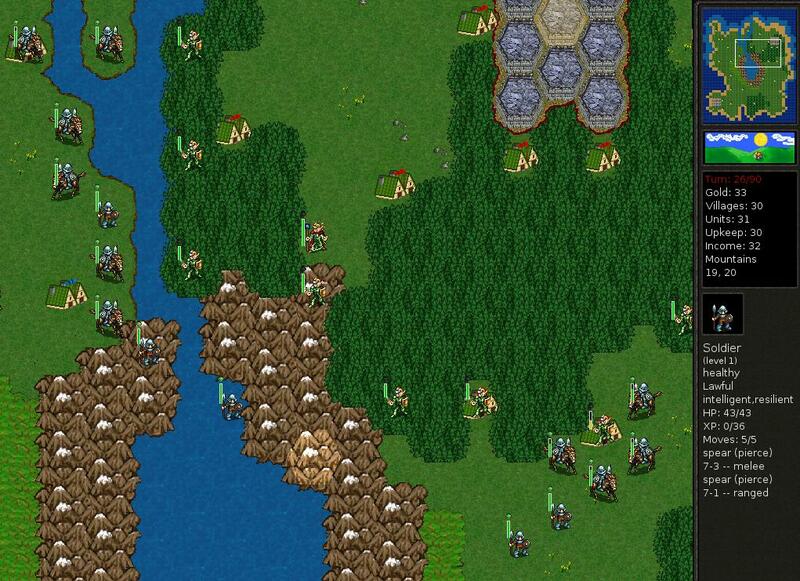 For instance, Elvish units have 70% defense in forest, meaning that you will have 30% chance to hit Elves on forest. There are no calculations displayed, because there is nothing to display -- if you are attacking an Elf on forest, you will have 30% chance to hit them. Likewise, if you are attacking an Elf on grassland, you will have 60% chance to hit them. No calculations at all -- it's just a lookup table. You can gain access to this lookup table: firstly, in the latest version, if you click on a unit and select them to move, while you are mousing over the hex to move to, two numbers will be displayed in the top right hand corner -- e.g. (2,60%) -- this means that it takes 2 movement points to move over that terrain, and the unit has 60% defense in that terrain. I will also note here that there are two types of attacks which violate these rules: 'magical' attacks always have 70% chance to hit, no matter what. 'marksman' attacks always have at least 60% chance to hit when attacking. As you might imagine, this makes magical and marksman attacks very useful and strategic. (Mages and some undead units have magical attacks. Elvish Marksmen and Sharpshooters have marksman attacks). Anyhow, thanks for the review! I hope you continue to enjoy the game. This is a fairly old entry and meanwhile Battle for Wesnoth (which I only discovered this afternoon) is nearing 1.0, but I wanted to say that I entirely agree with everything, I even felt the same way about the Warlords II Deluxe reference, PZ reference etcetera. I would most definitely pay € 19,99 for a remake of Warlords II Deluxe, even if it would just be the same game, running under Windows XP with the ability to see more of the battlefield by pumping up the resolution. I've recently discovered this game and fell in love with it. My first experience with "hex styled" games was actually with a board-game called Settlers of Cataan. Perhaps you could update your review to reflect the new version: 1.0.2 which was released for OSX on December 1, 2005. Check out recent "developer" versions of Wesnoth. The graphics, music, and general polish of the game are amazing compared to the way it was when you reviewed it.